My sister-in-law sent me this today. I felt compelled to share it with all of you. We are all in different places in our lives. 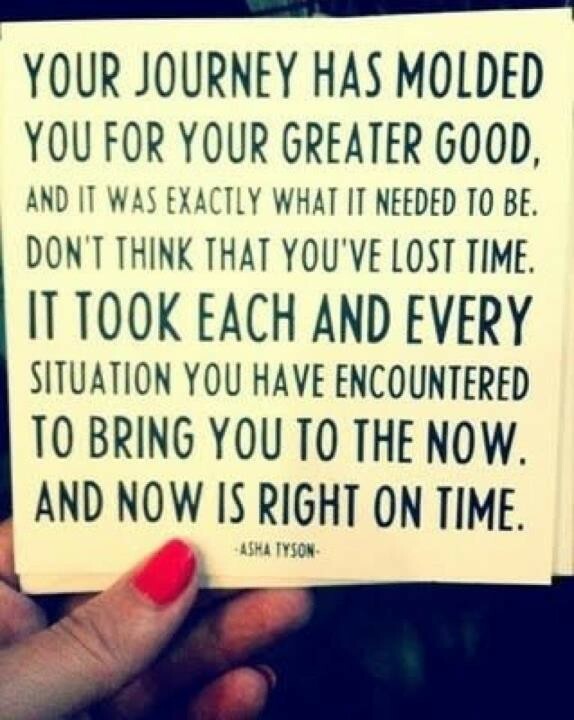 I know that my journey, as hard as it has been, has brought me to where I am. And what a great place that is. Everything has aligned. I have a new school, a new grade level, and soon a new place to call home. I have the confidence to go and do whatever I want to in life; so do you! As difficult as life seems some days, we have to go through it to get to the other end. It is when we try to go around what life brings us that we don’t get to where we need to be. It’s like being in the vast oceans and never swimming to the shore. You are just circling with no destination in mind. You have to have a vision of where you might want to be, so you have a direction. Walking blindly on your journey only leads to more confusion and a lack of self-esteem which we all need to keep moving forward. There are certain movies that I enjoy watching. They give me that warm feeling inside. I think we all have them. One of mine is “You’ve Got Mail” I watched it this morning, as I was drinking my coffee with my boys at my side. (My kitties) There are a lot of great messages in that movie. As many times as I have watched it, I saw it from a different perspective this morning. She was devastated that she was losing her store. The only thing she knew for years. “What will I do?” she kept saying. How many of us keep saying that to ourselves when we are faced with change? I saw myself. I kept making excuses to myself as to why I couldn’t leave my school; to make that big life change that so many of us need to make. When I finally made the decision to leave and trust that God would put me where I would flourish, the doors just opened for me. He has put me on a new path; a new journey has begun for me. As it can for you, if you choose to make it happen. I know it is frightening for some. I will say, my trust in the Lord helped me to move on. I felt no fear, because I knew this is what he wanted for me. Trust is something we all need to get back. It takes time, I know. I can’t begin to express my feelings of joy of where I am at. If you are not here yet, you will get there! Let go of the anger, let go of the fear. Trust your instincts, and keep moving forward!